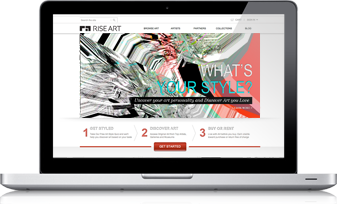 Let Rise Art be your guide. Take our fun quiz and discover art you love. Our curators select original works from up and coming and established artists tailored to your interests. Enjoy original art in your home and directly support talented artists. Rent art and rotate as often as you like, or use credits from your rental towards purchase. All art rentals are shipped ready-to-hang, and include free shipping both ways. 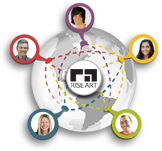 Rise Art works directly with talented independent artists as well as top museums and galleries to help you discover art you love. Choose from original paintings, photographs, prints and sculpture. Buy or rent the the artwork and take advantage of bespoke framing services. All Rise Art purchases come with our no-hassle returns policy. We know, its a novel idea. We launched art rentals to help people collect art without the risk. Live with art and enjoy it at home at low monthly rates. Rotate works on your walls, and earn credits towards purchase.